Jun 8 Are Shipping Containers the Future of Farming? 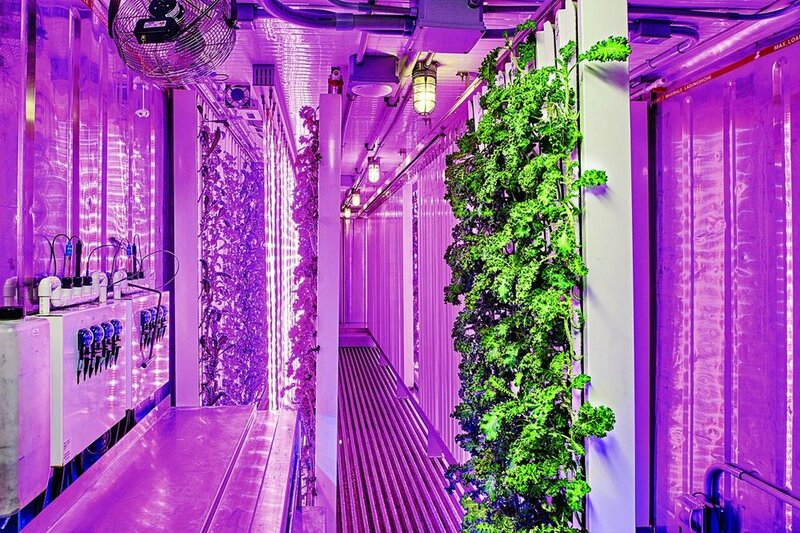 The startup Freight Farms is using repurposed freight containers and LED lights to grow acres’ worth of produce in a fraction of the space. INSIDE THE CAVERNOUS INTERIOR of a former Boston-area taxi depot—walls covered in graffiti, pools of water on the concrete floors—three gleaming green-and-white containers sit side by side. The steel boxes are former “reefers”—refrigerated shipping containers used to transport cold goods. Bone-chilling rain is falling outside, but inside the 320-square-foot boxes, it’s a relatively balmy 63 degrees, and the humid air is heavy with the earthy smell of greens. Filling each box are 256 neat vertical towers of plants, bathed in a noonday-intense pink light. The crops being cultivated here—lettuce, herbs and other leafy greens—are not what we’ve come to expect from this kind of operation. But the company behind this agricultural innovation owes a large debt to America’s pot farmers. Freight Farms was founded in 2010, its existence predicated on a bet that LEDs would soon become efficient enough for farming as if the sun had disappeared—without breaking the bank. Co-founder Brad McNamara puts it this way: “Traditional research said, yeah, LEDs are good, but the more important research was that they were improving at a Moore’s-Law rate.” Moore’s Law, used to describe the exponential increase in computing power over the past 50 years, can be applied to LEDs thanks in part to the needs—and considerable resources—of marijuana growers. In addition to 128 LED strips, each “farm” has a water circulation system, 8 gallon-size tanks of liquid fertilizer and a propane tank for producing supplemental CO2—all running on as little as 10 gallons of water and 80 kWh of energy per day. Under the right conditions, a grower can go from seeds to sellable produce within six weeks. According to data pooled by the company, an average Freight Farms box can produce 48,568 marketable mini-heads of lettuce a year—the growing power of two acres of farmland. Freight Farms is part of a rapidly expanding field: Food and agricultural technology startups received $4.6 billion in investment in 2015, almost double the $2.36 billion that poured into the sector in 2014, according to a report from agriculture investment platform AgFunder. Companies like John Deere and Monsanto have long invested in new technology for conventional farming, but we’re now seeing a disruption of farming itself. In 2010, Gotham Greens completed what was then the world’s largest rooftop greenhouse, perched atop a Brooklyn warehouse. “When we started this thing in 2009, we were one of the only ones out of this new guard of hydroponic indoor farming,” says co-founder and CEO Viraj Puri. “In 2016, there’s probably 100 of us.” Near Chicago, FarmedHere, which sells produce to Whole Foods, operates a 16,000-square-foot warehouse filled with towers of hydroponic greenery. In Newark, N.J., AeroFarms, which recently received over $30 million from investors such as Goldman Sachs, is transforming a 70,000-square-foot steel mill into the world’s largest indoor vertical farm. Freight Farms has received $5 million in funding to date and projects to sell 150 farms this year, at $80,000 each. Selling produce to consumers has proved difficult for many ag startups, but Freight Farms operates no commercial farms itself; instead, the company supplies the technological infrastructure and tools to grow. As a result, its business model has less in common with agricultural operations than it does with Google or Facebook, from its start in a tech incubator to its reliance on data, code and automation. Every Freight Farms box sends a river of data—such as temperature, humidity readings and CO2 levels—back to the company’s central servers. Just as Google becomes more powerful as more people use it, each Freight Farms owner benefits from insight gained across the network. Buyers, many of whom are first-time farmers, are trained in a two-day course and connected by a private online forum where they share everything from data on crop selection to marketing ideas. There are more than 60 Freight Farms containers installed in 22 states and two Canadian provinces, in climates ranging from the long winters of Ontario to the sweltering heat of Texas. In a development that surprised even the company’s founders, the containers are increasingly making their way onto traditional farms for supplemental income outside the growing season. But most are parked in the interstitial spaces of cities, from warehouses and underneath highway overpasses to alleyways behind the restaurants where their crops are served. The result is hyperlocal produce, which sometimes travels just a few feet from farm to table. “We harvest it in the morning, and often it’s in a salad for lunch,” says Bobby Zuker, co-owner of Green Line Growers, which operates out of the former Boston-area taxi depot. That just-picked freshness comes at a price. Green Line Growers sells its mini-lettuces for $1.25 a head—more than twice the cost of typical organic store-bought lettuce. Like many tech services before it, Freight Farms is starting off as a niche product for the rich, but that may not always be the case. The cost of growing indoors is likely to drop with improvements in the efficiency of LEDs, which are projected to require half as much energy in 2030 as they do today. Gotham Greens CEO Mr. Puri cautions that indoor farming is unlikely to render traditional farming obsolete. “Hydroponics and controlled-environment agriculture lends itself to certain types of produce, like highly perishable leafy greens, salads, herbs and vining crops like tomatoes, cucumbers and peppers,” he says “But a lot of other ag staples can’t be grown in a commercially profitable way, like grains, root vegetables and tropical fruit.” For the fortunes of Freight Farms and its competitors—not to mention American consumers on the whole—that may not matter. According to the U.S. Agriculture Department, the market for organic produce in the U.S. was $15 billion in 2014. Right now, a Freight Farms container can grow six of the 10 most popular vegetables in America, and demand for those items is expected to increase if Freight Farms achieves its ultimate goal of producing vegetables without pests or pesticide for less than the wholesale cost of their conventional alternative. If that happens, boxed farming could go a long way to feeding a growing population with shrinking arable land. And assuming Uber continues its success, there’ll be plenty more abandoned taxi depots, too.